A glassy carbon electrode modified with multiwalled carbon nanotubes within a poly(allylamine hydrochloride) film was used for the determination of propylthiouracil in pharmaceutical formulations. 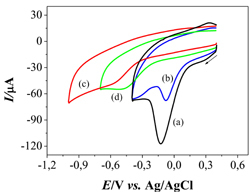 The obtained cyclic voltammogram showed an anodic peak at 0.684 V (vs. Ag/AgCl (3.0 M KCl)) and a cathodic peak at –0.088 V of the oxidation product adsorbed on the electrode surface. Applying an accumulation potential of 1.0 V for 60 s, the propylthiouracil was determined by using a cathodic stripping voltammetry at 200 mV s–1. The analytical curve obtained was linear in the propylthiouracil concentration from 5.0 to 58.0 ?M in a Britton-Robinson buffer solution (pH 2.0), with a detection limit of 1.0 µM. The proposed method was successfully applied for the determination of propylthiouracil in pharmaceutical formulations.